Anthem, BioWare’s upcoming online loot shooter, has some cool ideas. Unfortunately, the game’s demo last weekend was so busted, it was hard to get a good feel for the game. The problems started as soon as the demo went live on Friday, January 25. Many, myself included, were greeted by an error message that read, “We’re sorry, but the EA servers reached max capacity. Please try again later.” In some instances it was possible to get as far as selecting a male or female character in the opening menu before the game would automatically restart. Later in the afternoon, the connection issue spread to EA’s other games and services, including people’s ability to log into and post on EA Help, the company’s official customer support site. Those issues eventually subsided, only for a whole host of other problems to crop up. Chief among them was an infinite loading screen. Whether trying to load the game or leave Fort Tarsis, the game’s main hub area, the loading screen bar would fill up to around 95% and then stall out indefinitely. Sometimes restarting the game helped. Sometimes the same thing happened. Sometimes it happened after finishing a mission and trying to go back to Fort Tarsis, with earned XP sometimes disappearing in the process. I spent way too long staring at screens like this. Rubber banding, in which game sequences slow down, stutter, or even repeat, was also a problem throughout the weekend. By Saturday night, on Xbox One at least, the game was more or less impossible to play even when I managed to successfully avoid getting trapped in loading screens. Some players also experienced enemies disappearing mid-combat only to randomly re-appear later on. Other players still had trouble accessing the demo, or never got the link for a special code that could be used to invite up to four friends to play the game with them. There were also problems with new Javelins not unlocking after players leveled up. Though BioWare eventually fixed the issue, late Sunday just before the demo was set to end, the studio decided to unlock all four Javelin classes for every player. Despite playing very much like a beta testing session, the weekend wasn’t pitched as one. 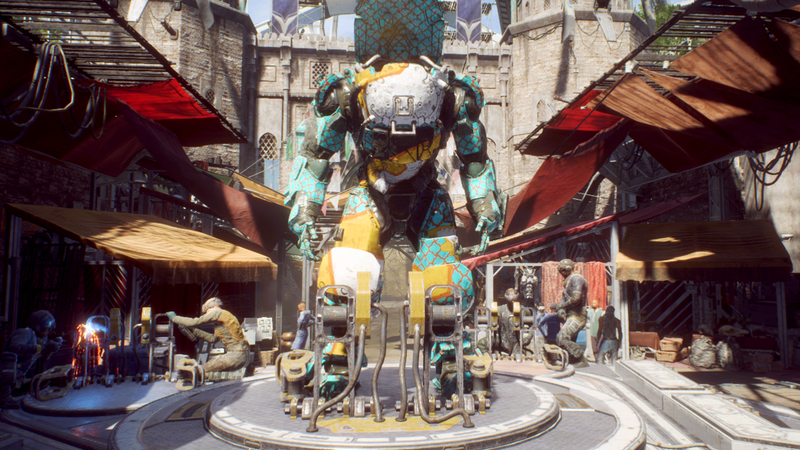 Instead, the demo was marketed as a “VIP” bonus for people who pre-ordered Anthem or were either paid EA Access or Origin Access subscribers. Everyone else would have to wait until the “open” demo is available the weekend of February 2. Michael Gamble, the game’s lead producer, also announced that the game had gone “Gold,” meaning it had passed certification for things like bugs on both Xbox One and PS4, just a couple days prior to the demo going live. The confusion over whether or not players were signing up to get a sneak peak at a finished game or test out the server load wasn’t helped by the fact that many EA games now have multiple release dates, Anthem included. It officially launches on February 22, but is actually available on February 15, three weeks from now, for anyone who subscribes to EA Access or Origins Access. BioWare’s head of live service, Chad Robertson, published a post on the company’s blog late Saturday apologizing for the demo’s problems, stressing that contrary to speculation on social media and the game’s subreddit, none of them stemmed from a lack of servers. “We appreciate everyone’s patience and sincerely apologize for those who have had issues getting into the game,” he wrote, calling out the overall connectivity issues, bugs preventing people from gaining access to the demo, and infinite load screens in particular. According to Robertson, the studio had only seen the infinite load screen problem in isolated cases previously and thought the issue had been addressed. “Unfortunately, the problem is exacerbated in the real-world where differences with player’s ISPs and home networks introduce new behavior,” he wrote, adding that it would be a “difficult one” to fix. BioWare has also said that the demo was an older build of the game that didn’t include some of the bug fixes the team has made in recent weeks. Late Sunday night, BioWare announced on Twitter that details on improvements coming to the game in time for next weekend’s demo would be announced sometime on Monday. [Update - 1:47 p.m.]: Robertson posted another update on the BioWare blog today in which he says the studio is working to address many of the above problems ahead of the next demo weekend. “We’re doing more scale testing this week, particularly to be ready for the opening rush of players on Friday, and to verify we’ve got ‘infinite load’ problems improved, the latter of which was a primary frustration for many players,” he wrote. Correction: a previous version of this article stated that some players would lose loot earned during a mission if they had to exit out of the game because of a glitch. Players who encountered this issue say the loot would eventually show up in their inventory if they continued playing for long enough.